1-Grate Coconut and keep aside. Chop onions and tomato into small pieces. 2-Take a Pan add oil and heat it, once heated add Ginger Garlic Paste stir it, then add Onion ,heat it till it turns brown and soft. 3-Now add Tomato and saute it until its cooked ( about 2 mins). 4-After that add chilly powder, coriander powder , turmeric and cumin powder keep mixing as you heat it, make sure no clumps are left. 5-Now add Chicken mix it, cook for about 3 minutes under medium flame. 6-Add Salt according to Your taste, mix. 7-Then add Grated coconut and mix, cook for about 2 mins and then add garam masala and mix. 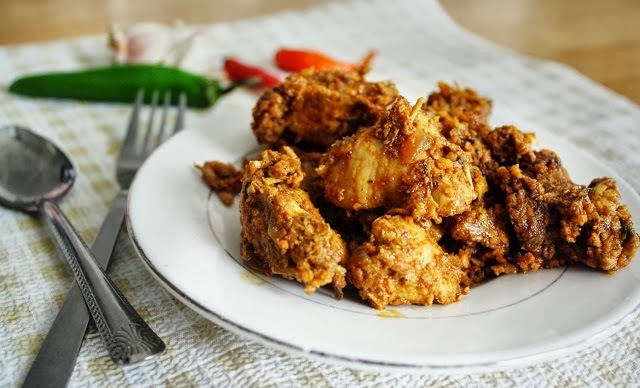 9-Chicken sukka is ready, serve it Rogni Naan or Rice.